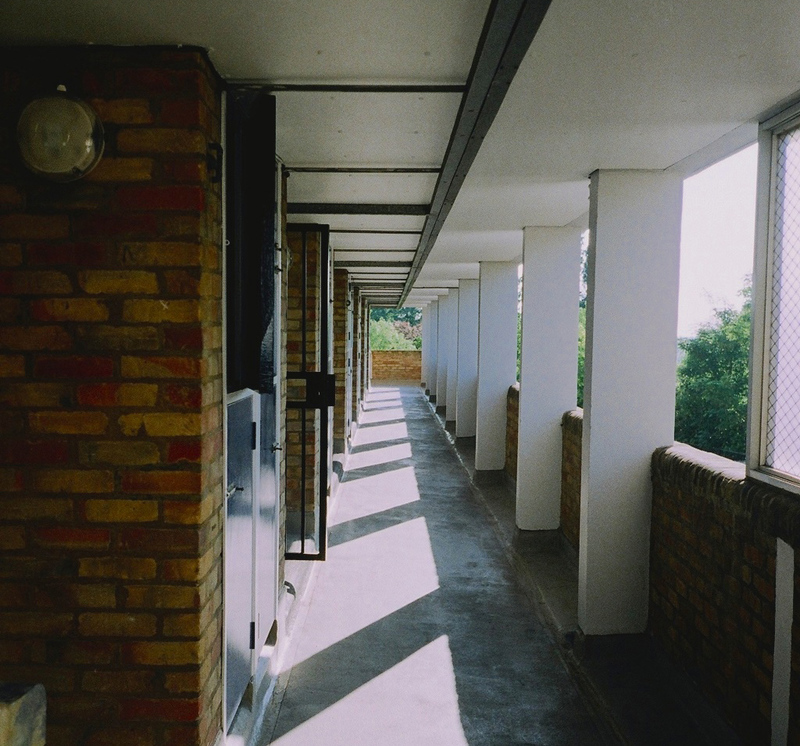 Two encounters with a masterpiece of modernist social housing highlight the difficulty in reconciling a fleeting sense of awe with people's everyday experience. Dawson’s Heights is a vision. 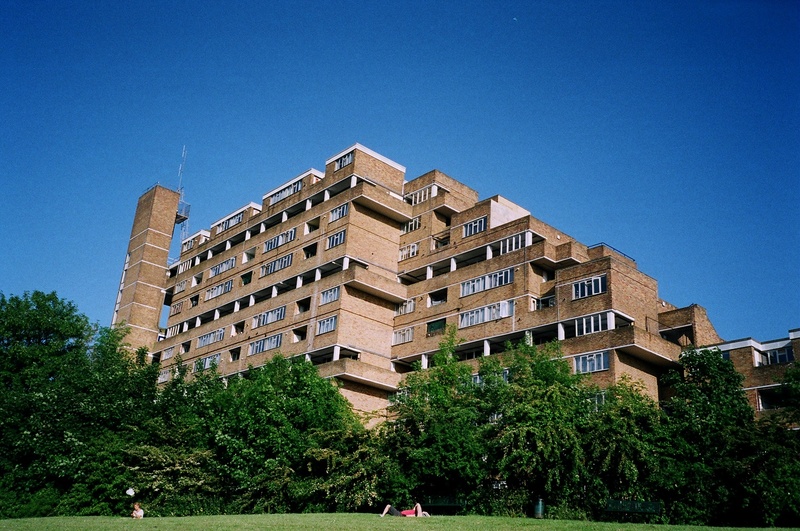 Built between 1968 and 1972, the South London social housing project sits on top of Dawson’s Hill in the Borough of Southwark, overlooking the city to the north. My first sight of it was from a distance. On a Sunday in spring I was heading towards Denmark Hill Overground after having visited the exhibition of David Hockney prints at Dulwich Picture Gallery with my mum and my brothers, so I was already in high spirits. As we walked I clocked the monumental structure poised on the edge of a hill in the direction of the Horniman Museum. I had vague recollections of noticing it before from various vantage points in Peckham, perhaps from the window of my train (although I haven’t seen it on my journeys to work since then). It was a shock, seeing it there so strikingly out of place and not knowing what it was despite having lived in South London for some time by that point. My brother, an architect, knew it straight away. A follower of Owen Hatherley’s now dormant blog, he’d read a report of the writer’s visit to the building some time ago. Attaching a name and a context, I determined that I had to pay a visit, and at the earliest possible opportunity. I reflect with utter fondness on the charming early summer’s afternoon spent leaning against the balcony of the building’s top floor corridor. The vibe that day was very pleasant. It was an absurdly good idea for a first date. 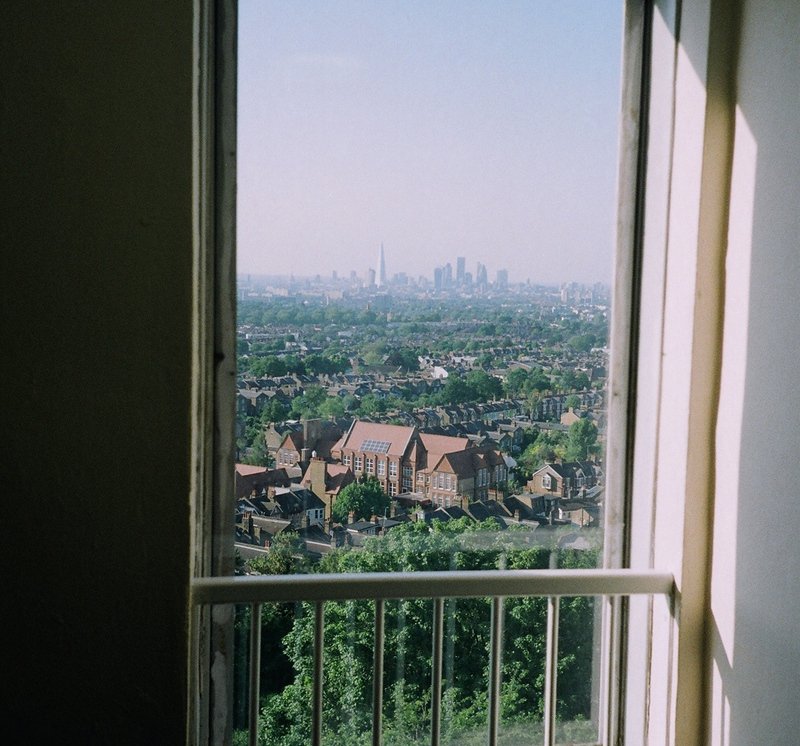 At the top floor we looked out over the London landscape bathed in sunlight, not a cloud to speak of, and alone exploiting the under-appreciated view from the south side of the City. There really was no one around up there and only a few people on the park leading up to it. Who needs Hampstead Heath when you can enjoy all to yourself the opposing view from a masterpiece of modernist social housing? Why, we both asked, can’t all housing be like this? The building is characteristic of a particularly high watermark in social housing in the UK where balance could actually be achieved between maximum utility and excellent design. Take the balconies. They were probably allowed only because they also doubled as fire escapes; otherwise such a feature tended to be dismissed as the wanton profligacy of an overambitious architect. And the architect Kate Macintosh deftly utilised the specific terrain to a tee. She used a ziggurat shape for the side facing the hill, learning from her previous experience on Sheffield’s Park Hill in which she “disliked the apparent flattening of the hill produced by the constant height of each meandering super-block”. This choice has also helped supply sunlight to most of the flats, even throughout the winter. Macintosh was 26 when she began the design for Dawson’s Heights. She was working for the London Borough of Southwark’s in-house architecture department. I’ll say that again, the borough of Southwark had an in-house architecture department and it allowed a 26 year old to design one of its major projects. 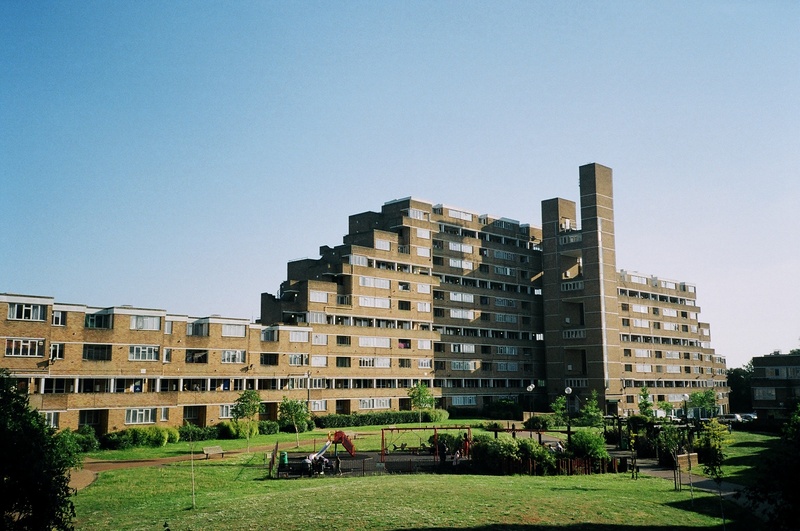 It was built at the tail end of the boom in state-led social housing provision in the UK. Indeed, the project draws obvious comparisons with Robin Hood Gardens, a building much derided at the time, disliked by its inhabitants and adored by a dedicated section of the architectural community. Dawson’s Heights is perhaps saved from the same sort of disdain because of the clear attempts made to fit it into the local surroundings. I think my personal reflection helps answer the subsequent question of why perhaps all architecture cannot be like this. After all, should all architecture make you want to break down and weep at how gorgeous it is? And besides, is this beauty not largely informed by my personal experience of an unfamiliar and exceptional building, both from afar and up close on successive sunny days? My thoughts here draw in part on the idea of the sublime. While I can’t do justice to the abundant philosophical discussion on the subject, it will suffice to say that the sublime is the quality of greatness. Distinct from beauty, the immeasurable and transcendent greatness which the sublime describes is inclined to summon a sense of awe, surprise and even discomfort. As demonstrated by a host of urban wanderers of the 20th century (Breton, Debord, Sinclair etc.) the urban sublime is something best encountered on foot, where one can suddenly uncover the unfamiliar and the extraordinary in the midst of the everyday. So, across my two walks, it was not just Dawson’s Heights grandiosity from afar that caused my sense of the sublime. Rather, it was the experience of unfamiliarity when faced with the site up close. It was in walking up Dawson’s Hill, in the overgrown grass, passing the handful of people sat enjoying this secret view. It was in the ascent of the empty exposed staircase to the empty balcony. And it was in sharing it with someone new. But while my experience matters, Dawson’s Heights is also the daily residence of hundreds of people. Their sentiments are definitely more pertinent to the success of the building. Which begs the question: can they encounter the same sublime experience? In his writing on the sublime, Immanuel Kant relays the story of the geographer Horace Bénédict de Saussure. In his expedition to the mountains of the Savoyard region, de Saussure’s wonderment was met with derision by the local inhabitants. Kant observed that overfamiliarity with an environment stifles the cultivation of the sublime experience. This surely also goes for the inhabitants of Dawson’s Heights. They are understandably more concerned with how well the building functions and how well it is maintained, things I didn’t pick up on in my encounters with the building. In short, it is fair to assume they are most content when they don’t notice the building. The work of Ian Nairn offers a counter to this line of argument. Ian Nairn often drew on notions of the sublime throughout his work. His disdain for the endless monotony of post-war suburban new-builds (developments for which he coined the term “subtopia”) was contrasted with a frequent reverence for the peculiar and idiosyncratic buildings, old and new, that existed in the midst of this prevailing monotony. In these reflections and in many others like it, Nairn focuses on the importance for buildings to convey a personality, and one which expresses the spirit of the place in which they are situated. A building, in Nairn’s view, must engage with its inhabitants and its environment and it must be an expression of them. If a building speaks of its inhabitants, it can all the better speak to its inhabitants. In such a dialogue, from time to time, the inhabitant could experience a much more intimate sense of the sublime than that sought by the urban wanderer who seeks out the awe-inspiring remnants of a bygone architecture, gushing (as I have here) at a fleeting experience of something that has been inhabited for decades by people whose lives are woven into its fabric. I can’t tell whether Dawson’s Heights achieves this, although it seems to have had a pretty good go, which is more than can be said of the countless new housing developments springing up across the capital existing, like Nairn’s office blocks, in loveless apathy until the time comes for demolition. Lived there in WW2 b4 they were built Have you any pics pre developement?